Rights activists have urged the UN to change its policy in eastern Democratic Republic of Congo after a leaked report said the rebellion there was worsening. Human Rights Watch called for a greater effort to tackle a global crime network backing the ethnic Hutu rebels. 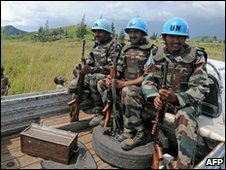 The leaked report, by UN-mandated experts, said there had been an upsurge in violence despite the UN joining the Congolese army to fight the rebels. The Security Council has been debating the findings of the experts. Rights groups have long criticised the Congolese government and the UN over the offensive against the rebels, known as the Democratic Forces for the Liberation of Rwanda (FDLR). The US-based Human Rights Watch (HRW) has been one of the main critics - saying the UN risked complicity in murders and rapes. The group's Anneke Van Woudenberg told the BBC's Network Africa programme that the leaked report and her own research showed that current policies were unlikely to succeed. "There needs to be a comprehensive approach to dealing with this group [the FDLR]," she said. "The report that was leaked today shows the huge diaspora networks that assist in money-laundering, in arms-trafficking, in the extraction of minerals and in the sale of those minerals. "Until you cut off that side of it, I don't think these operations are going to have any success." The UN has actively supported the operation in the hope that it could bring stability to the region. But the leaked report says: "Military operations have not succeeded in neutralising the FDLR and have exacerbated the humanitarian crisis." The UN, however, has defended the role of its mission in DR Congo, known as Monuc. Spokesman Manoj Manoubai pointed to successes Monuc had had in other parts of the country - particularly in Ituri province where a bitter conflict ended in 2003 and several alleged warlords have gone on trial. "Thanks to the work Monuc did, districts like Ituri today are at peace," he told the BBC's World Today programme. "They used to have over 20 different armed groups active in Ituri, today Ituri is pretty much a very peaceful place." The report does not criticise Monuc - but suggests there may be a contradiction in its mission to both protect civilians and back a military campaign widely accused of atrocities. The report says FDLR rebels - some of whose leaders were involved in the Rwandan genocide - have been able to use vast international networks to bolster their supply of arms and recruit extra soldiers. And it says the Rwandan rebels are also supported by senior members of the Congolese military - the very people who are supposed to be fighting them. It says the Congolese army has factions within it operating effectively as separate militias. The Security Council, which has already voted twice to continue the mission despite opposition from rights groups, faces a decision on whether to renew Monuc's mandate at the end of the year. Analysts say the UN will be closely watched to see how it takes into account the latest revelations.